Poets and painters of the 18th century sought a religious experience in the sublime continence of nature. They enjoyed meditating on the beauty of nature’s danger and the inherent tension and possibility it always offered of sudden and assured death – as a result for example, of a fall from a high cliff, a storm at sea, a volcano’s eruption or chasm opening in the earth to swallow one whole. They also meditated on the vastness, infinity, magnificence and the resulting exultation, the possibility of being raised up, temporarily overwhelmed in a spiritual sense and being made to feel small in the face of overwhelming emotion and the awe which nature can inspire. This transcendental desire has humans seeking a god or something greater in nature. Salton Sublime meditates on the meaning of sublime today in the midst of massive environmental degradation. 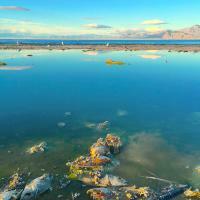 The Salton Sea in southern California brings a whole new meaning to the sublime as it contains both the awe-inspiring possibilities of a spiritual experience as well as terror and abject fear –especially of death. This project is a remnant of that same heritage of sublime art that seeks to engage the beauty and the terrifying danger of nature while examining both our reliance on and abuse of nature… it asks, what is ultimately left of the sublime? Can we inspire awe from terror? Roxanne Varzi is a writer, artist, filmmaker and anthropologist. She was the recipient of the first Fulbright to Iran since the Revolution and has been published in Public Culture, Aeon, Eastern Art Report, Savage Minds and The London Review of Books; quoted in the LA Times, New York Times, Chronicle of Higher and others. Her latest book Last Scene Underground: An Ethnographic Novel of Iran won the 2016 Independent Publishers Gold Medal Award. Her film Plastic Flowers Never Die is distributed by Documentary Educational Resources and has been shown in Festivals all over the world. Her first sound installation “Whole World Blind” premiered at Soundwalk in Long Beach, and was installed in Berlin, Paris, Philadelphia, San Francisco and is featured permanently at Publicbooks.org. This is her first installation at Ohrenhoch.